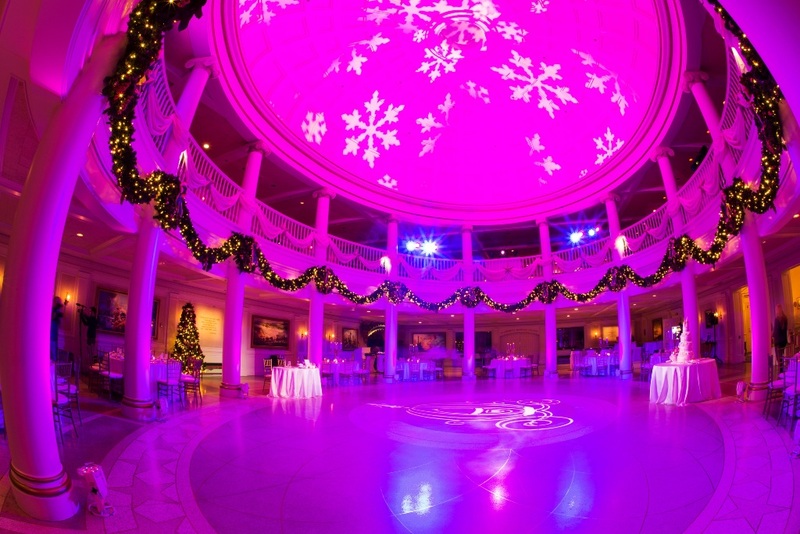 Disney Bride Nicole planned a Walt Disney World wedding at the Wedding Pavilion and American Adventure Rotunda Ballroom in December 2016. 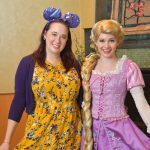 I can’t believe my time as a “Disney Bride-To-Be” is over! 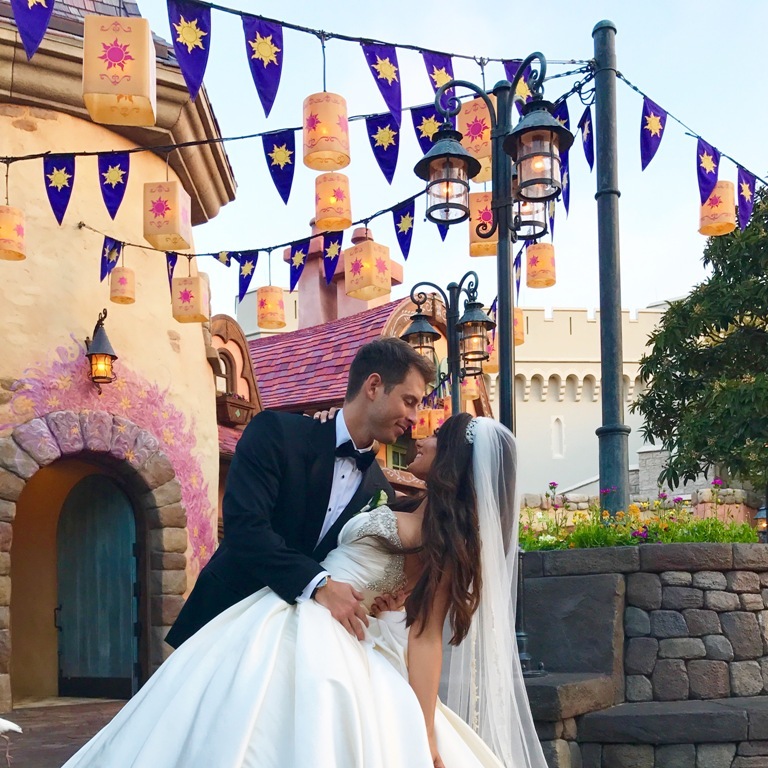 After spending a year and a half carefully planning and making difficult decisions about what to include and what not include on the day of our wedding, here are some tips for current and future Disney brides and grooms, based on our top seven favorite choices from our Disney wedding! This ended up being the most intimate and romantic experience throughout the entire day. 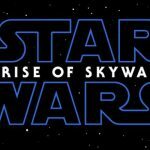 We debated about having a first look for a really long time. My fiancé is more traditional and was worried that not seeing me for the first time as the doors to the chapel opened would make it less special. I worried about this as well. What we didn’t realize was that we would be able to custom create what we wanted for our first look. It was both public and intimate. We chose to meet on the second story balcony of Disney’s Grand Floridian Hotel, with the towering Christmas tree in the background. This location was so special and unique for the both of us. I chose to have Michael see me from afar as I walked towards him, as opposed to just sneaking up behind him and tapping him on the shoulder like I’ve seen happen in most other first looks. 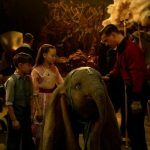 There are no rules; you can make it any way you envision it. I wanted to be able to see his reaction as I walked towards him, just as I would if I was walking down the aisle and seeing him for the very first time. We both kissed and cried when we first saw each other. 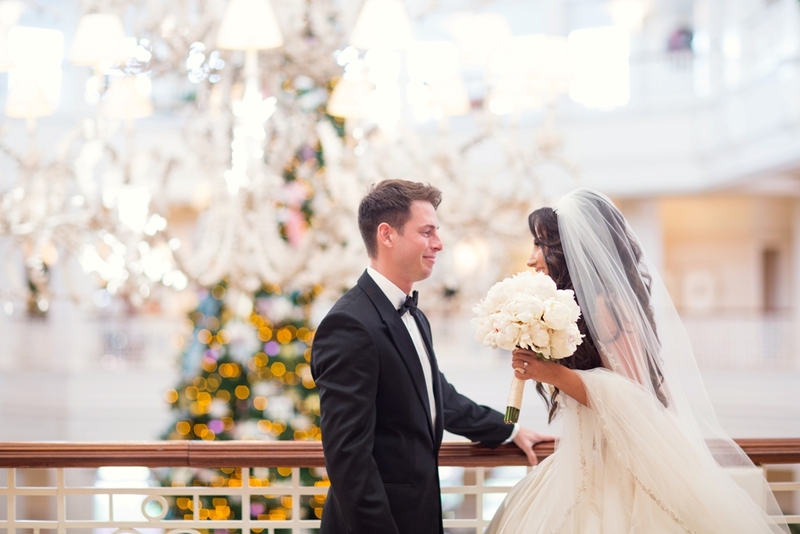 As we met at the balcony, our family and bridal party was down below looking up at us from the first floor of the lobby. The organist down below played A dream is a Wish Your Heart Makes, for the special moment, and our family members and friends erupted in cheers and clapping, as did other strangers and onlookers when we kissed. It was a moment we will never forget. 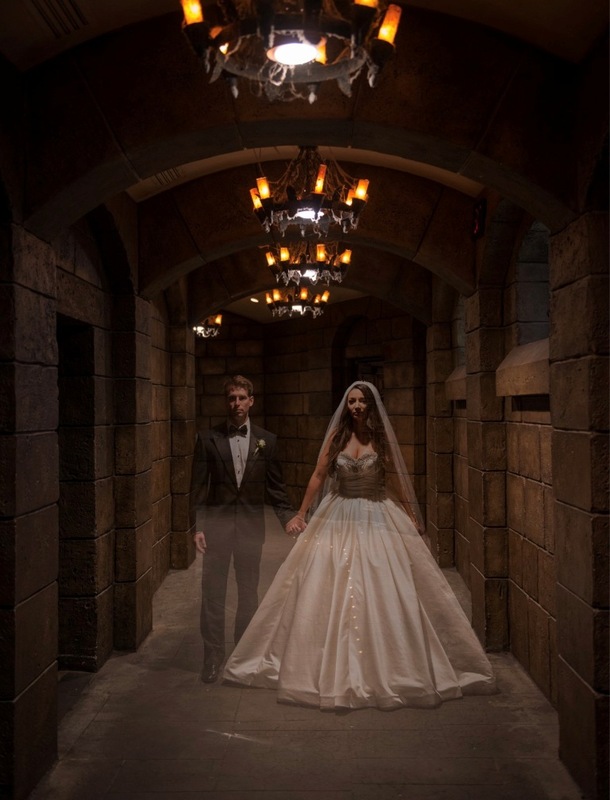 Now that we have actually gone through with our first look I can’t imagine our wedding day having been any other way. A huge benefit to having a first look is that you have a great deal of alone time with your spouse that you wouldn’t otherwise get if you were just to rush from the ceremony to the reception right away, being forced to squeeze in as many pictures as possible before the reception begins. You actually get to enjoy your cocktail hour and eat! The private time we had talking and taking pictures together before the ceremony was really special. 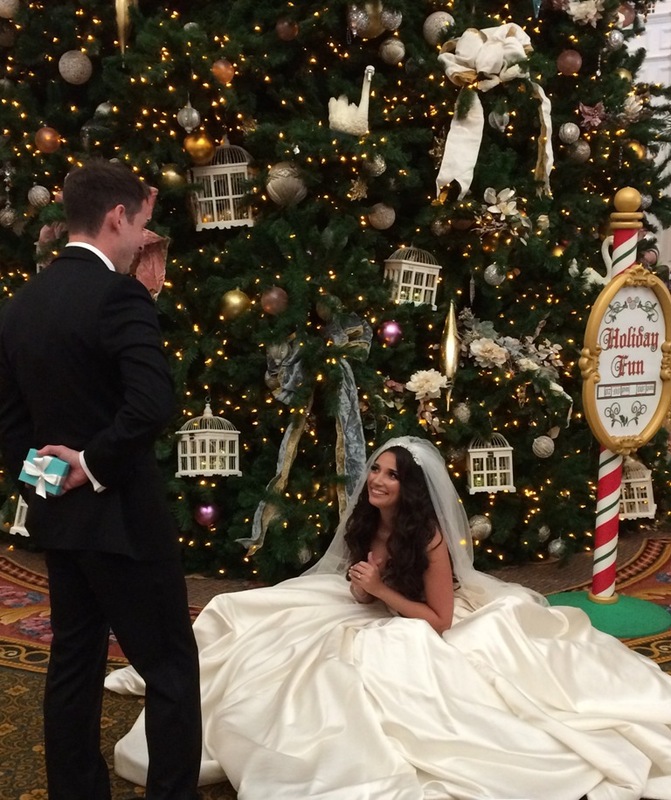 It even allowed us to have some time to exchange special wedding/Christmas gifts with each other under the Grand Floridian Christmas tree in the lobby. This was without a doubt one of my favorite moments of the whole day. I encourage future brides everywhere to think twice before they rule out the idea of a first look. Save money with non-floral centerpieces. 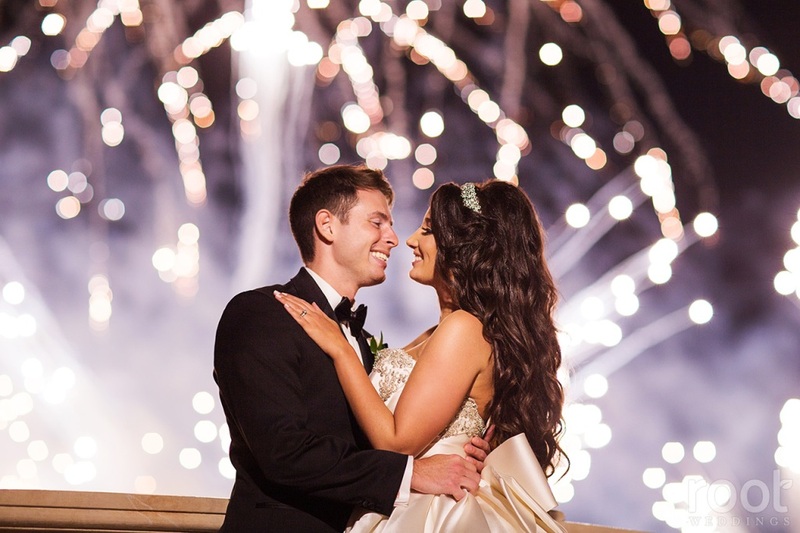 Consider skipping flowers at your reception to save money for other special experiences. I always imagined having very tall centerpieces with big full lush flowers cascading down the sides with dangling crystal embellishments. Unfortunately, a centerpiece like this can cost around $600 per table! 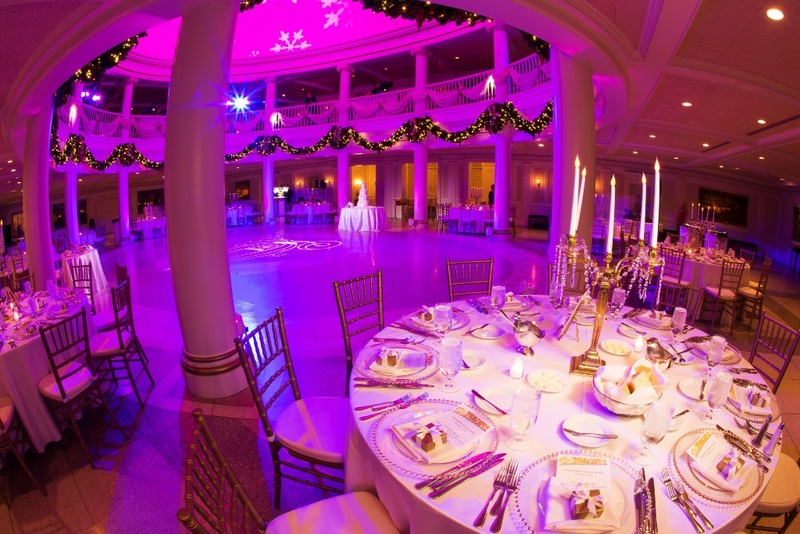 With ten tables to cover, we’re talking upwards of $6,000 for centerpieces alone! We decided to put our money elsewhere and opted for a very simple gold candelabra with dangling crystals for each table. This fit with our theme perfectly and saved us a ton of money in the long run. The rented candelabras felt classic, went with our color scheme, and added an additional Beauty and the Beast vibe to the reception. We didn’t feel like the tables were lacking and we didn’t miss the flowers at all. 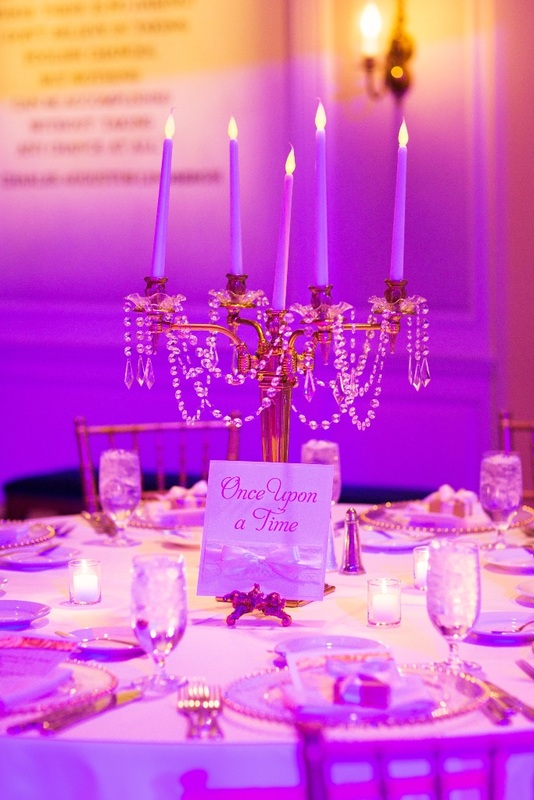 By doing this, we were able to splurge on other wish list items, like reception room up-lighting, a dessert party, and a photo booth, which was a blast for everyone! My absolute favorite splurge however, was, hands down …. 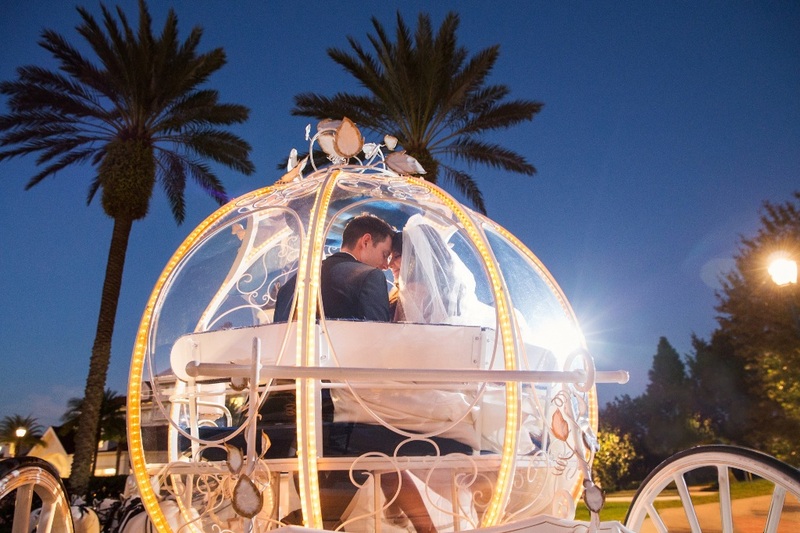 The coach picks you up at Disney’s Grand Floridian Hotel and takes you to Disney’s Wedding Pavilion before the ceremony. This allows you to have some quiet time with your parents or whoever is escorting you to the ceremony. 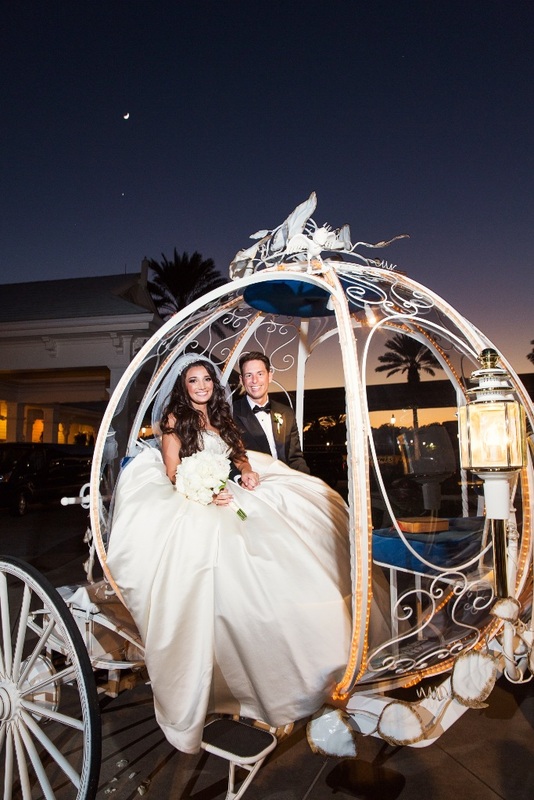 After you get married, the coach pulls up in front of all your guests and you and your spouse get to take another ride around the grounds together. This private time with my husband right after the ceremony was really important to us. There were no guests, and no photographers with us at this time. It gave us another special moment alone with each other. It totally didn’t hurt that we also felt like royalty riding around in a horse drawn coach all lit up. Strangers were literally cheering and clapping as we rode by. One of the best decisions we made for sure! 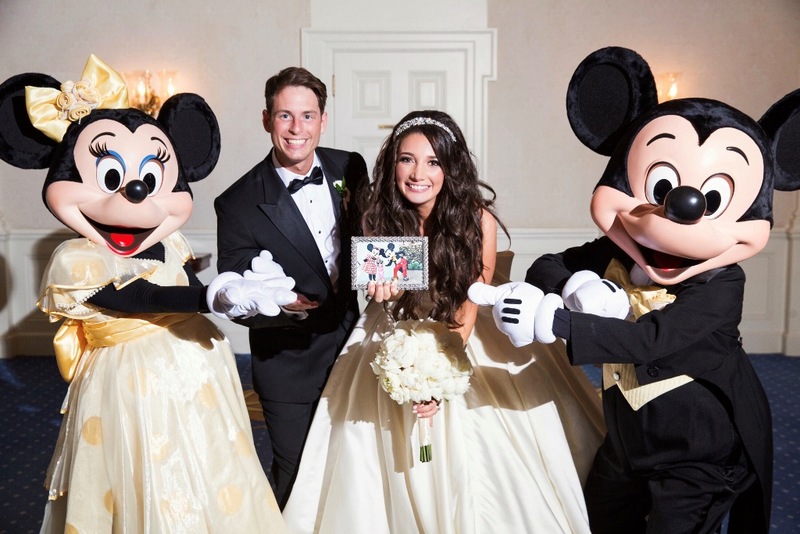 Have Disney Characters crash the wedding. 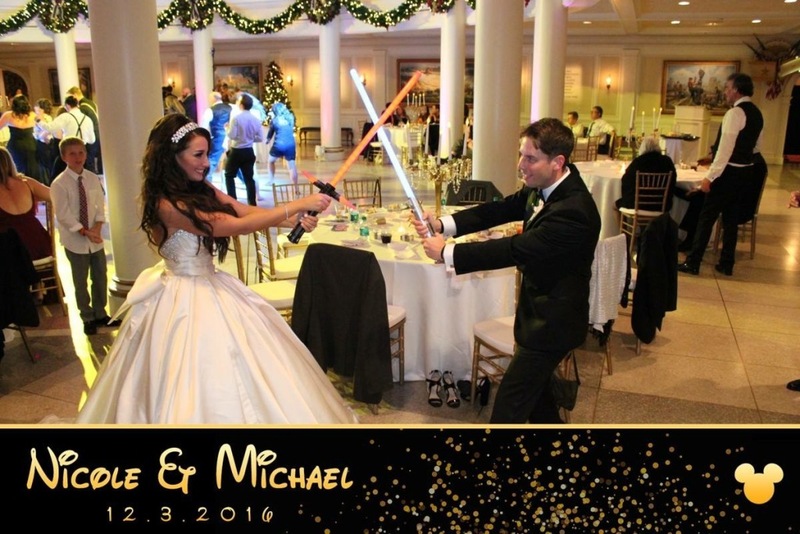 Seriously consider having Mickey and Minnie at the reception! I know some Disney couples struggle over this decision because they worry it’s too childish or wonder whether or not it’s worth the money. Who cares about what other people think, and yes, it is worth every penny! 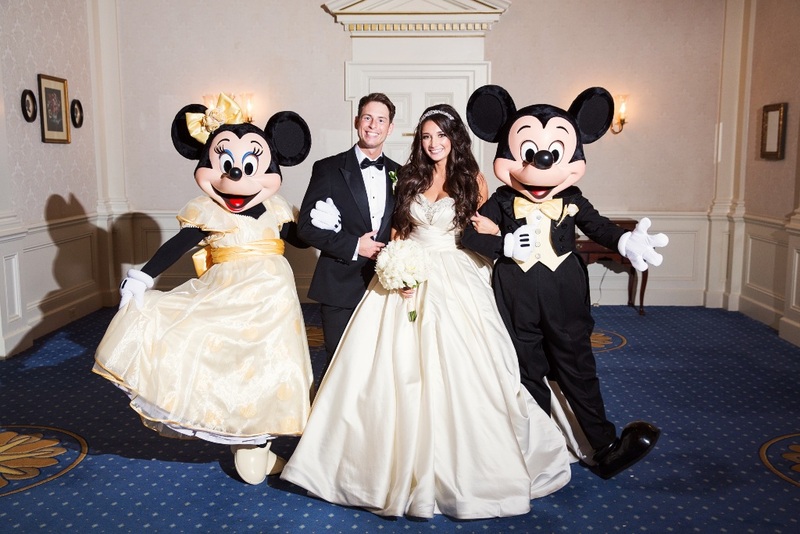 When Mickey and Minnie arrived at our wedding it was a showstopper! It got every single person in the room excited and dancing. I even noticed some of our non-Disney loving guests rushing over to get the perfect selfie with Mickey Mouse! It was a moment we’ll never forget. The characters took the time to pose for a picture and dance with every single guest at the wedding. We also had a special spotlight dance with Mickey and Minnie where we danced to The Rainbow Connection from The Muppets Movie. 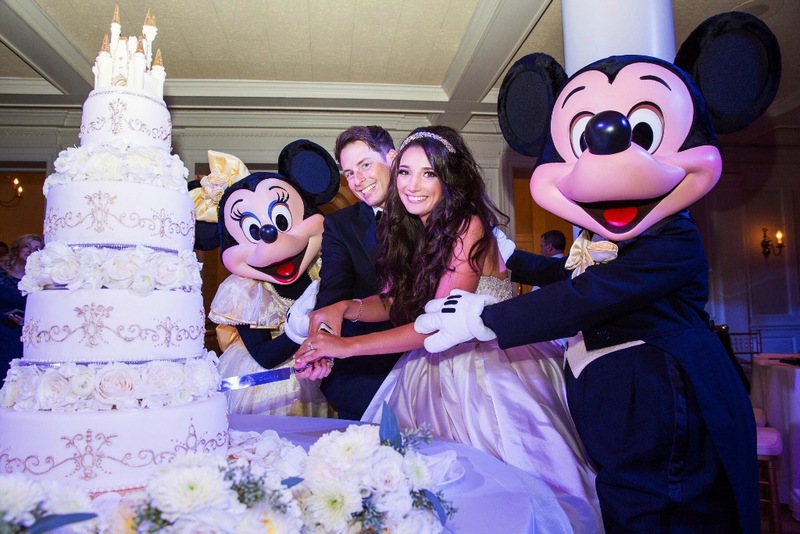 Afterwards, Mickey and Minnie assisted us in cutting the cake. 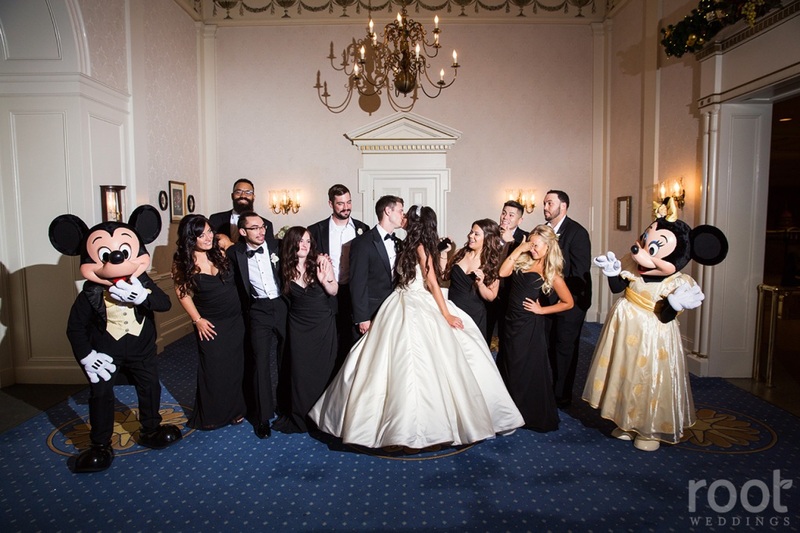 Finally, before Mickey and Minnie left for the night, they took more formal pictures with us alone. I even got to show Mickey and Minnie a picture of me as a baby meeting them for the very first time. This part of the night was a childhood dream come true. 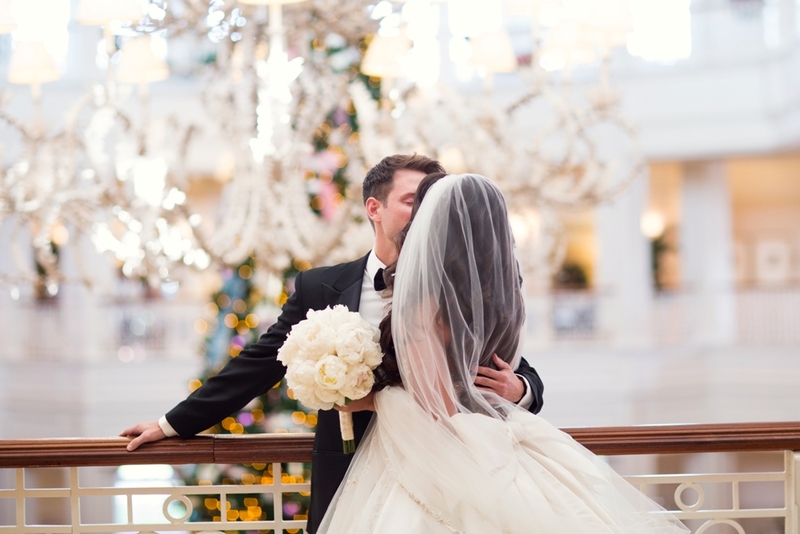 Get married during the holiday season. Having a wedding in December actually saved us money. 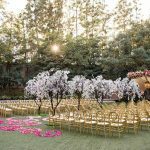 Our venue was already decorated, as were the parks. 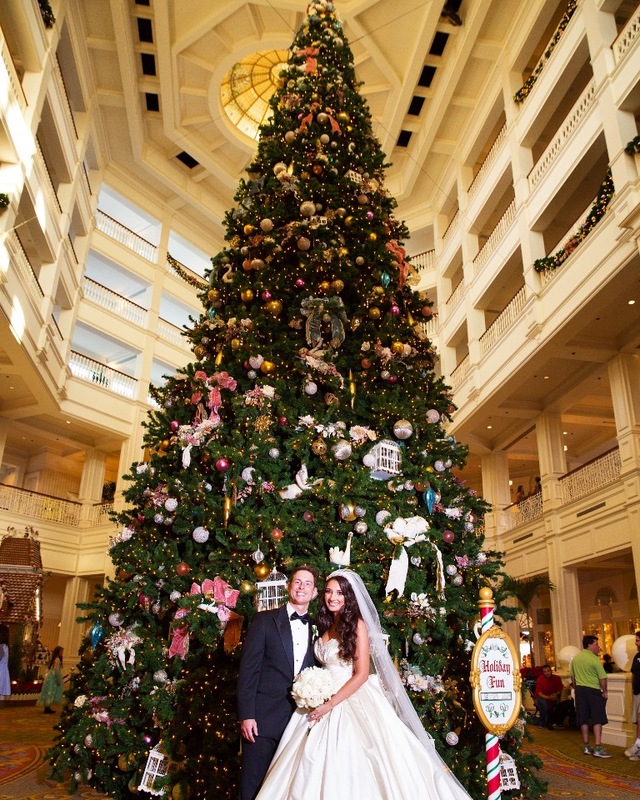 Twinkling Christmas trees, holiday wreaths and flowers adorn almost every wedding venue in the parks. There are Christmas lights everywhere! If you do decide on a Magic Kingdom portrait session, you can bet on Cinderella’s Castle being lit with the dream lights during your photo shoot! 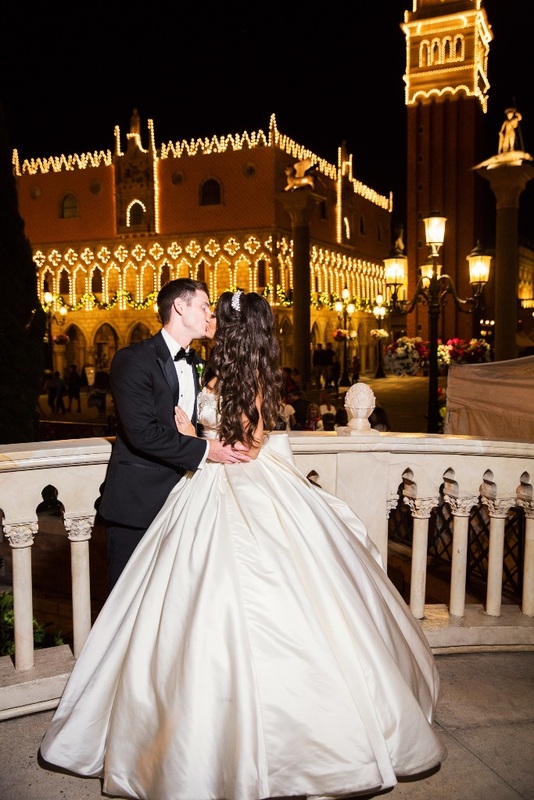 After the wedding you can even take advantage of going to Mickey’s Very Merry Christmas Party with all of your family members and friends. The weather won’t be excruciatingly hot and depending on the time of the month in November or December you choose, the crowds will not be that bad either. 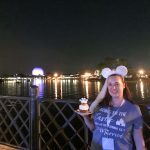 Having the reception in Epcot and adding VIP seating for Illuminations! This option was about $10 per person and I’m so glad we splurged on this. 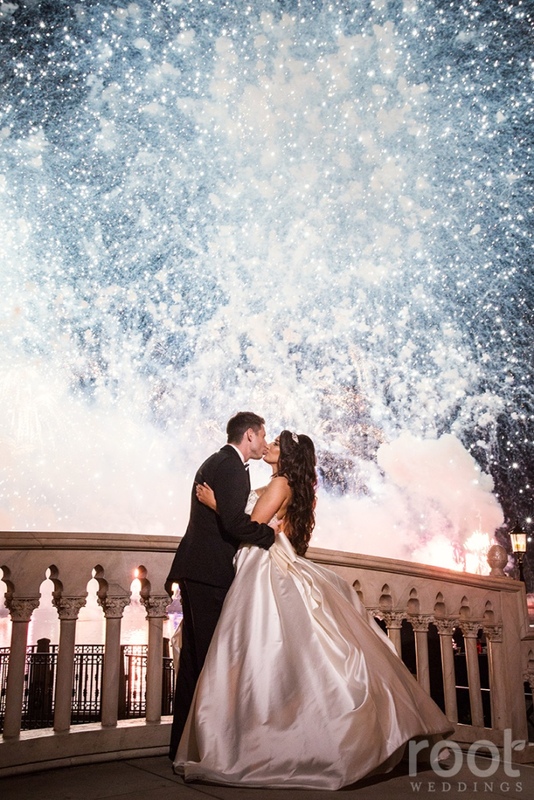 It’s considered one of the best firework shows in all of Disney for a reason. It also gives you another special moment with your spouse alone to take it all in. Our fantastic photographers, The Roots, set us up on Italy Isola’s bridge for pictures, where we had the best seat in the house for the show. After Illuminations, our guests also got a bonus holiday firework finale, which is only featured during Disney’s holiday season in November and December. Have a Magic Kingdom portrait session. 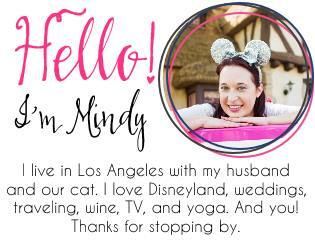 You only get married in Disney once. 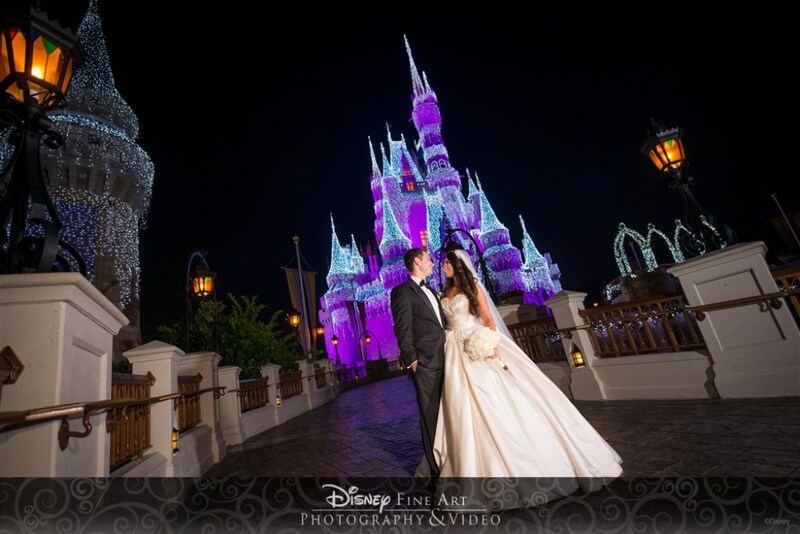 Take advantage of spending a morning, a few days after your wedding, taking pictures in the parks. People were like, “Oh geez, you have to put your wedding dress on again?” Let me tell you something, if I could wear that dress everyday for the rest of my life I would! 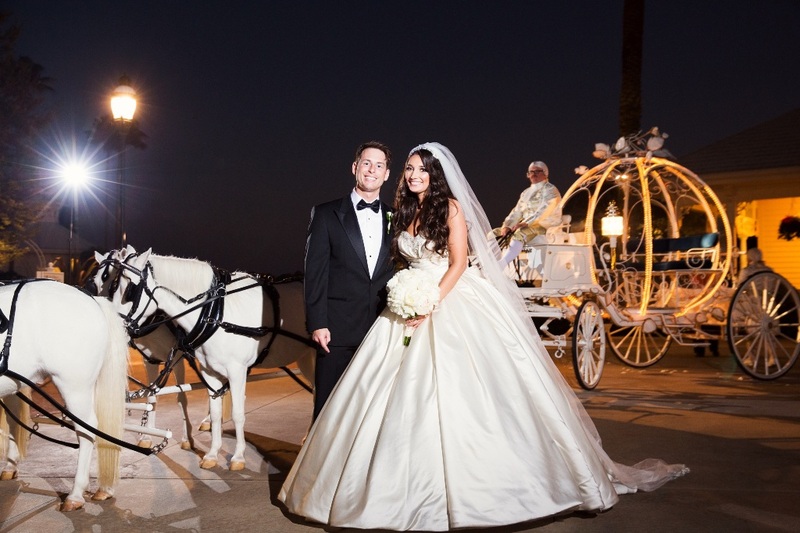 I LOVED my wedding dress and I never wanted to take it off. Yes, you do have to wake up before the crack of dawn to have a portrait session in the Magic Kingdom, but I promise you it was so worth it! You get a behind the scenes look at what goes on in the Kingdom before the park actually opens to the public. You also get unforgettable photos in front of Cinderella’s Castle as well as three other locations throughout the park. We chose to take our pictures by Cinderella’s Castle, the Tangled lanterns by Rapunzel’s tower, and our favorite ride, The Haunted Mansion. Afterwards, you can also go to other Disney parks to take more pictures. We chose to head over to Epcot after we were finished shooting in the Magic Kingdom to get some pictures in the World Showcase. You can also go to Disney’s Animal Kingdom or Hollywood Studios if you wish to take a second portrait session there. 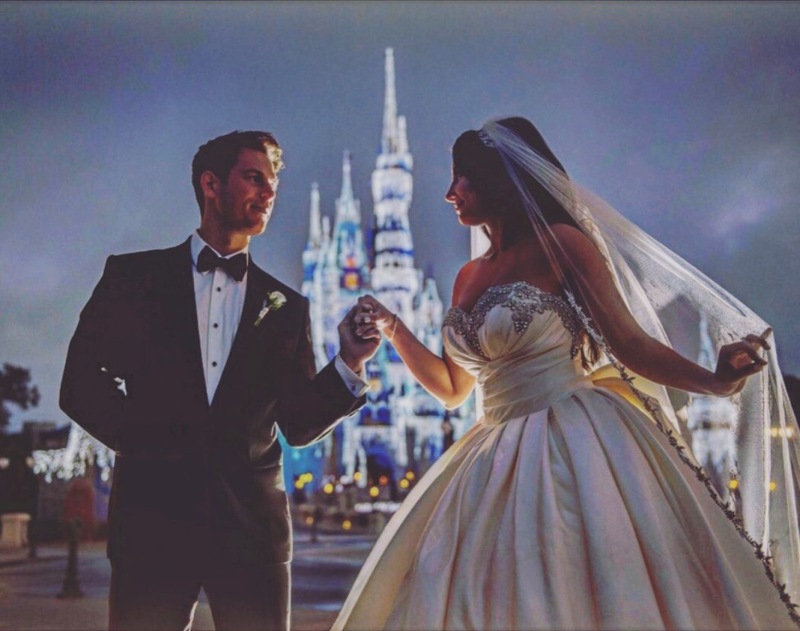 I hope these tips are helpful to future Disney brides and grooms out there! 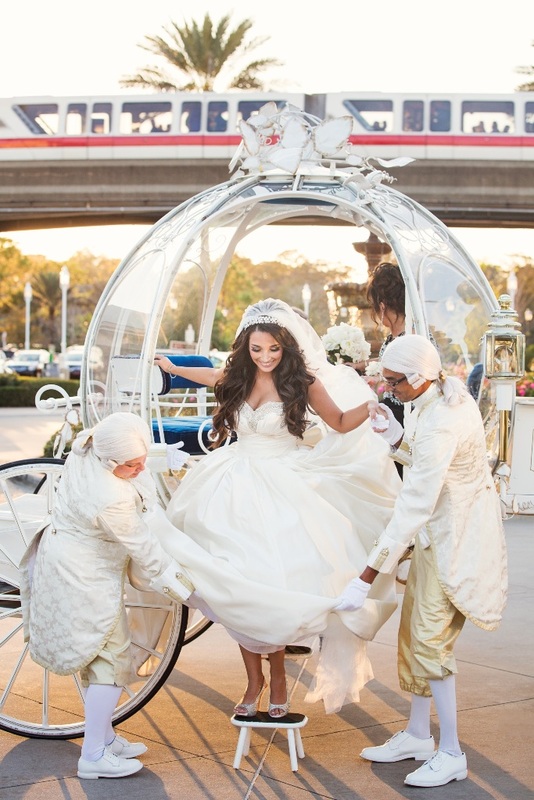 The day I was a Disney bride was the best day of my life! 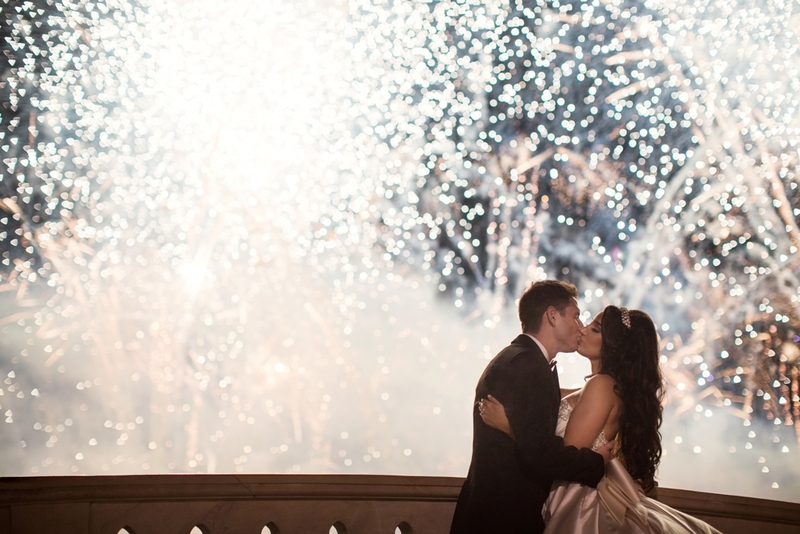 There’s not a thing we would change about our wedding day. I only wish we could go back and relive every single minute of it over and over again. It was truly the BEST DAY EVER! Does anyone know which Disney photographer did this Magic Kingdom portrait session? It’s amazing! The photographer is Ali. I hope that helps! Ali is amazing!!! 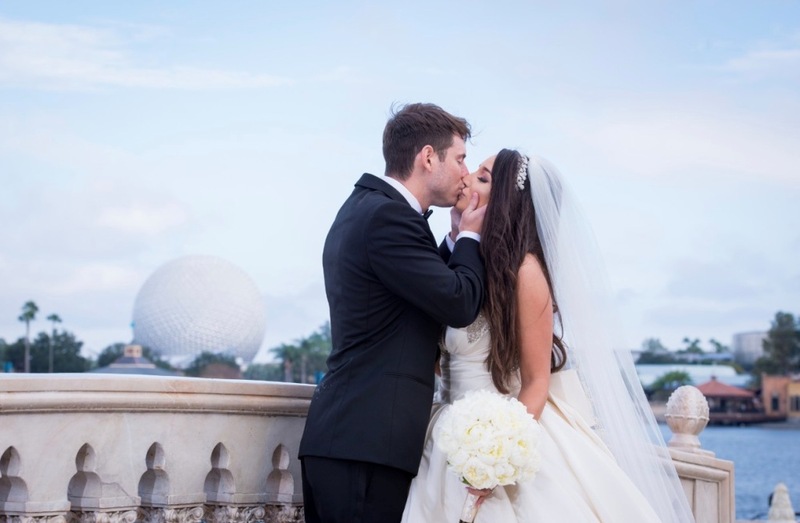 He just did our wedding portraits in magic kingdom and I literally am checking my email everyday to get the pictures back. I can not recommend Ali enough.